OCHOPEE, Fla. – The murky, placid shallows of Big Cypress National Preserve are quiet. Sounds of booted footfalls are barely heard, muffled by dense mangroves and the thick mud of the terrestrial Everglades. Suddenly, a flash of light brown is seen as a white-tailed deer bursts onto the path, scampering across the undergrowth and reclaiming refuge on the other side of the trail. But who is its aggressor, and is it following close behind in the bush? A panther pelt on display at the Florida Panther Festival (Photo by Molly DuVall). 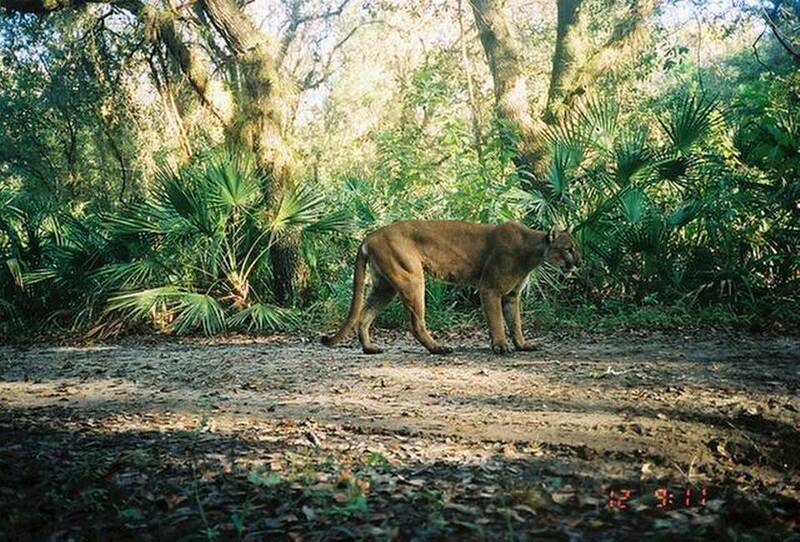 Despite their long-standing residence in the Big Cypress region, the Florida panther is rarely seen. Coupled with their elusive nature, the panther faces extinction as the number of heterogeneous couples dwindles. 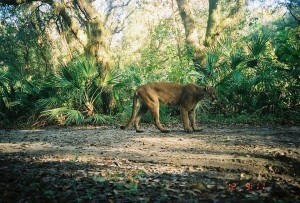 A Florida panther at a crossing (Photo courtesy of the Florida Fish and Wildlife Commission). That’s where the Florida Panther Festival comes in. The third annual event took place in early November at North Collier Regional Park, and offered many indoor and outdoor exhibits where Florida residents could learn about the lifestyle and protection of the state animal through seminars and outdoor activities. Ben Nottingham, manager of Florida Panther National Wildlife Refuge, said the goal was not only for guests to celebrate the Florida panther, but also to increase their awareness of how to safely coexist with panthers. Less than a week ago, West Palm Beach-based news organization WPTV.com (http://www.wptv.com/dpp/news/state/florida-panther-17th-panther-death-of-2013-reported-in-southwest-florida) stated that the 17th panther death of the year had been reported in Southwest Florida. It was reportedly struck by a car just outside of Fort Myers. At left, prints of wild animal tracks give Florida Panther Festival-goers an idea of what to look for at the park. Below, a young girl makes a new friend at the Florida Panther Festival (Photos by Molly DuVall). The good news is that Floridians can help save their state animal in a variety of ways. The Florida Fish and Wildlife Conservation Commission (FWC) sells “Conserve Wildlife” license plates to provide assistance to a variety of conservation programs to restore the habitats of manatees, sea turtles and panthers. But if changing your plates doesn’t interest you, one of the best ways to help the panthers is by word of mouth. “If you live in panther country, learn how you, your family and your pets and livestock can live safely with panthers and help educate your neighbors,” said Godsea. And, finally, visit and support the panther’s habitat. Directions — The entrance to Big Cypress is located on Interstate 75 (Alligator Alley) and US Highway 41 (Tamiami Trail). These are the main roads that traverse the site. Visitor facilities and most activities originate from the Tamiami Trail. What to Wear and Bring — From June through September daytime temperatures may exceed 90 degrees Fahrenheit with very high humidity, so wear breathable clothing and be sure to bring plenty of water and sunscreen. Mosquitos also densely populate the area, so be sure that you have bug spray on hand. Hiking boots are recommended, as this is the rainy season. Winter temperatures occasionally drop below 32 degrees Fahrenheit, so long sleeves are recommended. This is the busiest season in the park, with greater wildlife viewing opportunities. Go exploring towards dusk. Panthers prefer to rest during the heat of the day. Listen closely. Panthers are usually quiet, but communicate through vocalizations like peeps, whistles, purrs, moans, chirps, screams, growls, and hisses. Pay attention to small animals in the area. Panthers are known to eat white-tailed deer, feral hogs, rabbits, and armadillo, so keep a sharp eye out for any of their usual prey. Stay in a group – but stay quiet! Panthers don’t like loud noises, so be sure to keep your voice down.